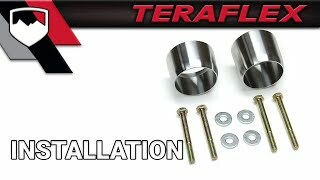 The TeraFlex JK/JKU Exhaust Spacer Kit is required for all 2012-2018 JK Wrangler and JKU Wrangler Unlimited models with 2.5” or more lift to prevent contact of the front driveshaft and the exhaust crossover pipe during suspension down travel. Exhaust Spacers install between the exhaust header flanges and the crossover pipe flanges to move the crossover pipe rearward for proper driveshaft clearance. Bolt-on installation.